Urbanarbolismo's musings on Museos de la Naturaleza, how huge ecosystems can be contained and preserved, led me to Ilkka Halso's work. The Finnish artist has a whole website on Museum of Nature: images that visualize huge natural preserves, all encased for future generations. 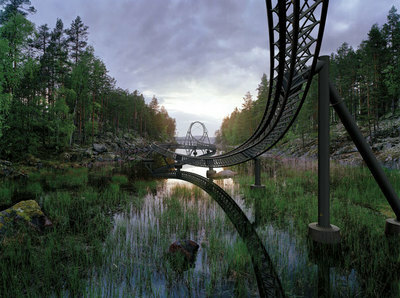 Even though we are partial to the psychedelic images Urbanarbolismo posted, our favorite is Roller Coaster (pictured). Which are of course one of my favorite memes.